Those of us of a certain age have lived with these characters for more than thirty years. We’re a bit attached. When the first little Star Wars movie premiered in 1977, the Vietnam War and Watergate were still fresh in the minds of Americans. The Middle East was an ever bigger mess than it is now, and we were pretty sure the Soviets could nuke us all at any moment. Enter Star Wars: A New Hope with its group of misfits going up against the all-powerful Empire. It’s the ultimate underdog story. Their situation seems hopeless, and yet they prevail. It was the right story at the right time. Sometimes we need to escape to a world where the good guys win. There's nothing wrong with that. Some of us are facing adversaries we know we won't overcome in this lifetime. We need stories like Star Wars. 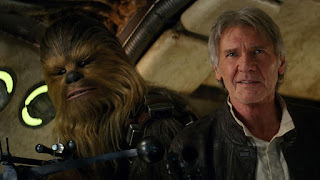 We want to visit with our old friends - Luke, Leia, Han, Chewie, and make new ones. J.J. Abrams took this story and our beloved characters and added jaw-dropping beauty. He had a huge task, and he delivered. Thank you, J.J. for taking us on another adventure. It was worth the wait.